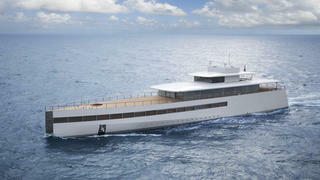 Starck also created the super-sleek, modernist exterior of the 78.2 metre Feadship superyacht Venus. Commissioned by Steve Jobs, who passed away before he could take delivery, she was launched in 2012. Her almost vertical topsides lead to a plumb bow with a gleaming metallic finish. Fittingly for the founder of Apple, her iconic profile is a study in elegant simplicity, with the satellite domes cleverly hidden within her mast. However, this bold, futuristic styling has led many yachting traditionalists to unflatteringly compare Venus to certain domestic appliances. 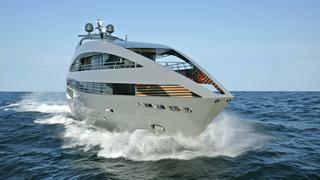 Starck also created the super-sleek, modernist exterior of the 78.2 metre Feadship superyacht Venus. Commissioned by Steve Jobs, who passed away before he could take delivery, she was launched in 2012. Her almost vertical topsides lead to a plumb bow with a gleaming metallic finish. Fittingly for the founder of Apple, her iconic profile is a study in elegant simplicity, with the satellite domes cleverly hidden within her mast. However, this bold, futuristic styling has led many yachting traditionalists to unflatteringly compare Venus to certain domestic appliances. With unusual exteriors, original shapes and groundbreaking design, these divisive yachts have challenged our perceptions of what superyachts should look like. Whether you love them or hate them, one thing is for sure — the yachts on this list will turn heads wherever they go. When you consider her distinctive trimaran form and sleek metallic finish, it's easy to see why Adastra has been hailed as the future of superyachts. Those sci-fi inspired exteriors reflect her truly fitting name, which means 'to the stars' in Latin. Launched by Australian yard McConaghy in 2012, this 42.5 metre multihull superyacht divides opinion — detractors argue that her overall length could be better used to create a more spacious interior. However, there is no denying the visual impact that she makes upon cruising into a new port. With unusual exteriors, original shapes and groundbreaking design, these divisive yachts have challenged our perceptions of what superyachts should look like. Whether you love them or hate them, one thing is for sure — the yachts on this list will turn heads wherever they go. When you consider her distinctive trimaran form and sleek metallic finish, it's easy to see why Adastra has been hailed as the future of superyachts. Those sci-fi inspired exteriors reflect her truly fitting name, which means 'to the stars' in Latin. Launched by Australian yard McConaghy in 2012, this 42.5 metre multihull superyacht divides opinion — detractors argue that her overall length could be better used to create a more spacious interior. However, there is no denying the visual impact that she makes upon cruising into a new port. The industry is no stranger to radical superyacht hull colours, but its more than just her metallic gold finish that makes Khalilah one of our most divisive yachts. This 2014 launch for American yard Palmer Johnson features an angular carbon fibre superstructure by Nuvolari Lenard and side deflectors that make her look more like a trimaran than a traditional monohull. 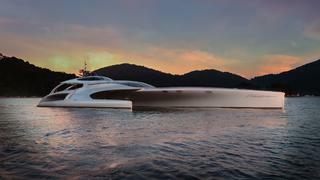 Love her or hate her, the staggering performance of this 49 metre is undeniable. As yard owner Timur Mohamed puts it: "30 knots on a displacement hull simply does not happen." Unless that yacht is called Khalilah. 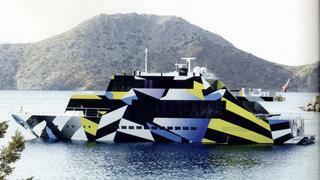 Judging by the yacht's name, the owner of superyacht Crazy Me is well aware of his yacht's divisive design. 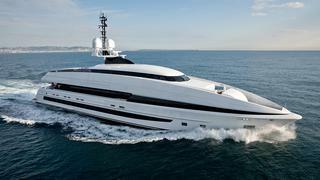 But while this 50 metre custom yacht by Heesen has an imaginative exterior, it's more about function than form. Crazy Me is designed to be extremely private, and while you might not be able to tell, she has ample outdoor deck spaces hidden from view by her unique superstructure. After a very long conversion process, a 1977 Dutch-built navy frigate was transformed into the glass covered 141 metre superyacht Yas. The first photos of the dolphin-inspired superyacht Yas underway emerged in 2015, showing off the incredible expanse of glass on the yacht's superstructure. But it's not just for outward appearances, the yacht's interior is bathed in light thanks to this glass-filled exterior design. Love it or hate it, Yas – the eighth largest yacht in the world – is certainly a shining example of divisive yacht design. After a very long conversion process, a 1977 Dutch-built navy frigate was transformed into the glass covered 141 metre superyacht Yas. The first photos of the dolphin-inspired superyacht Yas underway emerged in 2015, showing off the incredible expanse of glass on the yacht's superstructure. But it's not just for outward appearances, the yacht's interior is bathed in light thanks to this glass-filled exterior design. Love it or hate it, Yas – the eighth largest yacht in the world – is certainly a shining example of divisive yacht design. Thanks to nearly symmetrical design of this yacht, it can be hard to tell if she's coming or going. One thing is for certain, Ocean Sapphire is going to make you sit up and take notice. A massive set of stairs lead down from the upper deck to the foredeck, and likewise, stairways make a focal point aft. The 41 metre yacht, launched by Rodriquez Yachts in 2010, was designed by the world renowned architects Foster & Partners, who also penned the new Monaco Yacht Club. The imaginative yacht Ocean Sapphire is now available for charter, with prices starting from €115,000 per week. Thanks to nearly symmetrical design of this yacht, it can be hard to tell if she's coming or going. One thing is for certain, Ocean Sapphire is going to make you sit up and take notice. A massive set of stairs lead down from the upper deck to the foredeck, and likewise, stairways make a focal point aft. The 41 metre yacht, launched by Rodriquez Yachts in 2010, was designed by the world renowned architects Foster & Partners, who also penned the new Monaco Yacht Club. The imaginative yacht Ocean Sapphire is now available for charter, with prices starting from €115,000 per week. With an amazingly cool paint job by American artist Jeff Koons, 35.3 metre motor yacht Guilty is sure to be noticed in any port. But her exterior was actually inspired by WWII dazzle ships, whose wild paint jobs were designed as a form of distracting camouflage. Guilty's owner is an art collector, so there is just as much fine art on board this superyacht as her exterior styling would imply. 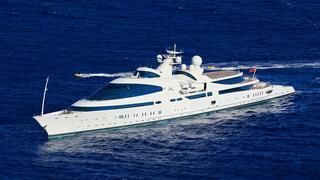 Inside or out, she is one of the most eye-catching – and divisive – yachts around. With an amazingly cool paint job by American artist Jeff Koons, 35.3 metre motor yacht Guilty is sure to be noticed in any port. But her exterior was actually inspired by WWII dazzle ships, whose wild paint jobs were designed as a form of distracting camouflage. Guilty's owner is an art collector, so there is just as much fine art on board this superyacht as her exterior styling would imply. 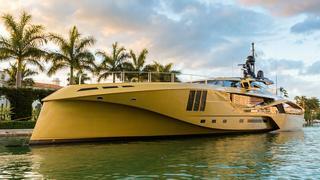 Inside or out, she is one of the most eye-catching – and divisive – yachts around. 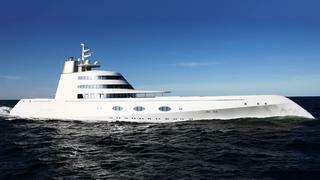 Opinion was certainly split when Motor Yacht A was launched in 2008 for forward-thinking yacht owner Andrey Melnichenko. The 119 metre Blohm+Voss custom yacht has become one of the most iconic and recognisable superyachts on the water today, with its submarine-inspired styling by Philippe Starck. And her owner Andrey Melnichenko isn't slowing down in his ambition to redefine what superyachts should look like. Indeed, he's pushing the boundaries of technology once again with Sailing Yacht A, which was recently delivered by Nobiskrug. The 142.81 metre is the largest sail assisted motor yacht in the world and is just as much a conversation starter as the original Motor Yacht A. 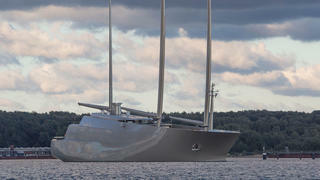 Opinion was certainly split when Motor Yacht A was launched in 2008 for forward-thinking yacht owner Andrey Melnichenko. The 119 metre Blohm+Voss custom yacht has become one of the most iconic and recognisable superyachts on the water today, with its submarine-inspired styling by Philippe Starck. And her owner Andrey Melnichenko isn't slowing down in his ambition to redefine what superyachts should look like. Indeed, he's pushing the boundaries of technology once again with Sailing Yacht A, which was recently delivered by Nobiskrug. The 142.81 metre is the largest sail assisted motor yacht in the world and is just as much a conversation starter as the original Motor Yacht A.